I am one of the few performers that perform KAMIKIRI. 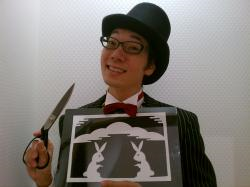 Various scenery, animals, characters are made by a scissor and paper. KAMIKIRI is a traditional art from old times in Japan. Besides, I perform the unique art that is arranged in contemporary style with the paper which is not only just white, but also full of colors. In HASAMIYA KAMITARO’s show, I cut speedily various colors paper in various forms with BGM. It takes three minutes a work, thirty minutes ten works, thereby speedily stage will be provided. HASAMIYA KAMITARO’s show will be given the gorgeous and good tempo stage in comparison with other performances. These works are given as a present to the audience soon on site, so it delight them very much. silhouett of visitors profile at the greeting. This art can correspond either Japanese traditional style or world culture or someting. Show in the hotel, Japanese festivals, commercial facilities (Such us PARCO, IEON), Hot-spring hotel, warm bath facilities, and so on. It depends on performer, performance time, or performance times a day.